This entry was posted in Club, Nordic News, Racing on April 7, 2015 by Alan Telford. The deep freeze that grips Northern Mongolia throughout the long winter creates an almost uninhabited wilderness. Groups of Mongolian reindeer herders known as the Tsaatan, also found in Siberia, have adapted perfectly to the limitations of the tundra climate. Some say that Modern skiing has its roots with the Tsaatan. This ancient race developed the ski as a more efficient way of herding their Reindeer in deep snow. Traditional ski making knowledge is still retained in but a few of the remaining Tsaatan communities, as is some of the most ancient shamanism and bush-craft on the planet. This Epic Journey takes you deep into the heart of Mongolian winter. Move North on skis through stunning winter forests and frozen valleys as you make your way into the Taiga. Here you will ski tour and use horses to access the higher peaks, most of which have never been skied before. You will stay in traditional Mongolian Gers or Yurts as well as the Tepees of the Tsaatan (Reindeer people). The Taiga is home to some of the last bastions of shamanism and a way of life unchanged for centuries. In this harsh climate the survival of a race depends on the survival of the reindeer herd. Learn from this ancient race, the art of crafting traditional skis. Test the skis as you help a family move their herd from deep winter to early spring pastures. The adventure culminates with the ice festival on mighty Lake Khovsgul. Here Mongolian heritage and tradition will be showcased with a wintry twist such as wrestling on the frozen lake and Ice horse racing. The chance to see and travel this remote corner of the planet on skis, meeting its mysterious people in deep winter is a world first opportunity. This entry was posted in Nordic News on December 10, 2012 by Alan Telford. Andrew Musgrave has been having an oustanding week at the Norwegian championships, on Thursday he came in second place against a field of Norway’s best skiers including Peter Northug. This has caused considerable consternation and soul searching in the Norwegian press. Read more about this at the BNDS website. Apparently BBC sport were not interested in this story although they were aware of it! On Saturday Andrew continued his excellent form with a 5th place in the Norwegian Championships 30km Skiathlon. Lying 21st after the classic leg he skied the 3rd fastest skate time to pull back to 5th overall. This entry was posted in British Nordic Development Squad, Nordic News, Racing on January 30, 2012 by Alan Telford. Inghams has contacted us to alert members to their ski holiday offerings, especially their cross country ski destinations. 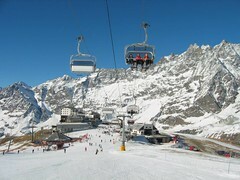 Already the winter destinations, like Cervinia ski resort, are preparing for the influx of winter visitors and skiers are gearing up for the winter season. There are many resorts offering cross-country skiing, so let’s remind ourselves of some of the premiere cross-country skiing resorts. This entry was posted in Nordic News, Uncategorized on September 21, 2011 by admin. This entry was posted in Nordic News on August 15, 2010 by Alan Telford. Huntly Nordic Ski Centre is hosting the following courses for the holidays. 26th to 30th July inc. or 9th to 13th August inc. 11am to 12pm. 19th to 23rd July inc. or 2nd to 6th August inc. 11am to 12pm. This entry was posted in Club, Nordic News, Uncategorized on July 11, 2010 by Alan Telford. They are also planning to run some rollerski races on 28th March in Hillingdon – watch the rollerski.co.uk website for more details. This entry was posted in Nordic News, Rollerskiing on January 20, 2010 by Alan Telford. Here’s the link to Bruksvallana results for 2009. Interpretation of Swedish is pretty basic here but it looks like Fiona Hughes took 1st place in the 19-20 Women’s group! Andrew Young came 5th (beating all the Swedes at the competition but one), Callumn Smith 12th and William Newman 33rd out of a field of 50 finishers. In the women’s over 21 years competition, which was won by Charlotte Kalla in 22:16, Posy Musgrave took 42nd place 3:41 slower than Kalla, Sarah Young took 52nd place 4:26 off the pace. 66 racers completed the race. Keep an eye for the results next weekend at Beitostoelen. This entry was posted in British Nordic Development Squad, Club, Nordic News, Racing on November 15, 2009 by Alan Telford.